I wish that Microsoft would create a Yammer training video whenever the interface changed. Yammer works exactly the same for all of us, so it would be nice if we all did not have to reinvent that wheel. What differs between customers, apart from the masthead they use, is their reasons for using Yammer. This results in very interesting case-studies of the benefits Yammer can bring in that organization. I have already highlighted a few in my earlier post, and I will continue to add those to my collection. But there are different themes for Yammer videos than demo’s or teasers. This hilarious video from Virgin Trains tries to stimulate the use of Yammer Groups as opposed to the All Company Network. By the way, their Yammer launch video (and the case study: getting an alpaca out of the train) is also worth watching! Although the look-and-feel may not be suitable for use in every organization, the recommendations at the end of every video are solid and helpful for all of us who have a role in managing communities on Yammer (or other enterprise social networks, of course). It’s discovering videos like these that make collecting intranet videos so much fun! By the way, you can filter on “Yammer” in my collection to see all Yammer-related videos. And as always, please let me know if you know any good additions! So…they are now in my collection, tagged with Yammer. I have found many that just demonstrate the standard functionalities. I think that is a waste of effort, since there are plenty of tutorial materials around. Therefore I have focused on videos that are specific to an organization, that demonstrate how you can use Yammer within your team, with your specific issues. Those add real value, because demonstrating a case that people can relate to, is a good way to make people understand the benefits of Yammer. This is more like a teaser, informing catering employees how to use a specific Yammer group to collaborate with internal and external partners. Tongue-in-cheek animation about project management in Yammer and the power of Yammer topics. I must admit that I was not aware of all functionalities of Yammer topics so I learned something new! I am sure I will be adding to my collection over time. And as always, if you know another promotion video for my collection, please share the link! 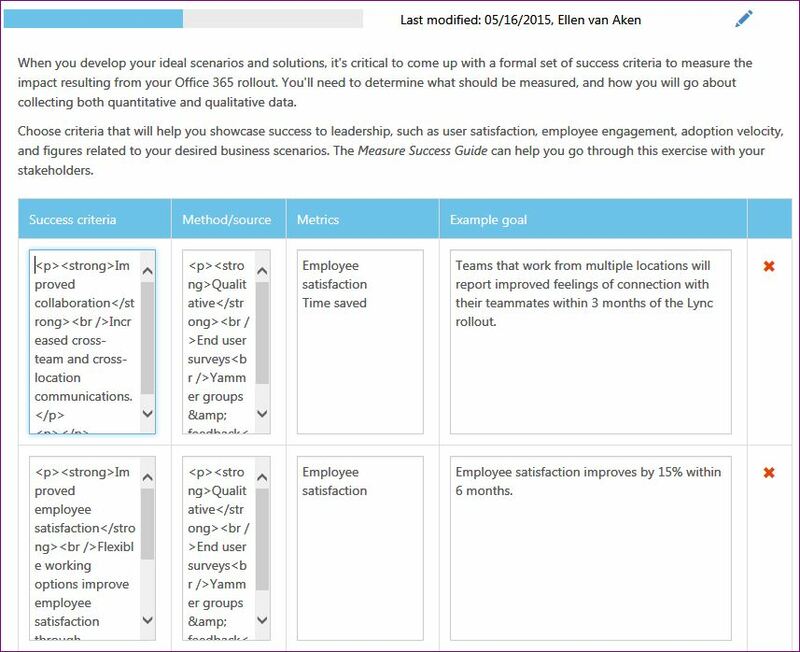 I recently had the opportunity to do a Yammer implementation for a specific team so I was eager to test-drive the tool and share my experiences. Go to https://success.office.com/en-us and go to Adoption > Adoption Plan. My default Dutch version does not have the Adoption Plan options, so please add “en-us” to the URL. How to create and access your plan. You can see different steps with their progress. You set the progress yourself using the Save (in progress – blue) or Finish (finished – green buttons below every topic. You open or close the item with the icon on the right of the section. As you go along, you will also see many document-based templates on the left-hand side of the page, such as tips or templates for posters/flyers. This blog focuses on the online plan. Progress Overview. You start with only grey boxes and you set the progress yourself. You can select which roles are involved and add their names. You can also remove all roles not needed. In this case, we only had a few roles, but it was a useful exercise to note the names and responsibilities for everyone in the project team. Adding the names to the roles. The tool tells you to use ”1-4 sentences” but it is unclear exactly how many characters you can use. There is no warning when you exceed the character limit. In that case your data is simply not saved, or an older shorter version is saved. Add information about the # of characters allowed for the Vision. Show a warning when you are using more. Make the Vision statement more useful, by e.g. prompting to check or revise the vision during creation of your plan. I understand that a tool like this can not tell you that “this action or metric is not in line with your vision”, but I would like to be prompted to review the vision or to check if your action plan will promote the vision. Next in line is the Scenario you are looking for. There are 5, and I chose “Work like a network”. You can then prioritize the scenarios, but we only had one so there was no need. Of course you have to measure if you are on plan. You get 6 examples, but you can add, edit and delete according to your own plans. 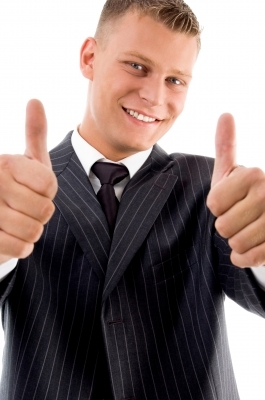 The Success Metrics section. Good content, but the display needs some work. In the Snapshot, check display – many spaces between words are missing. 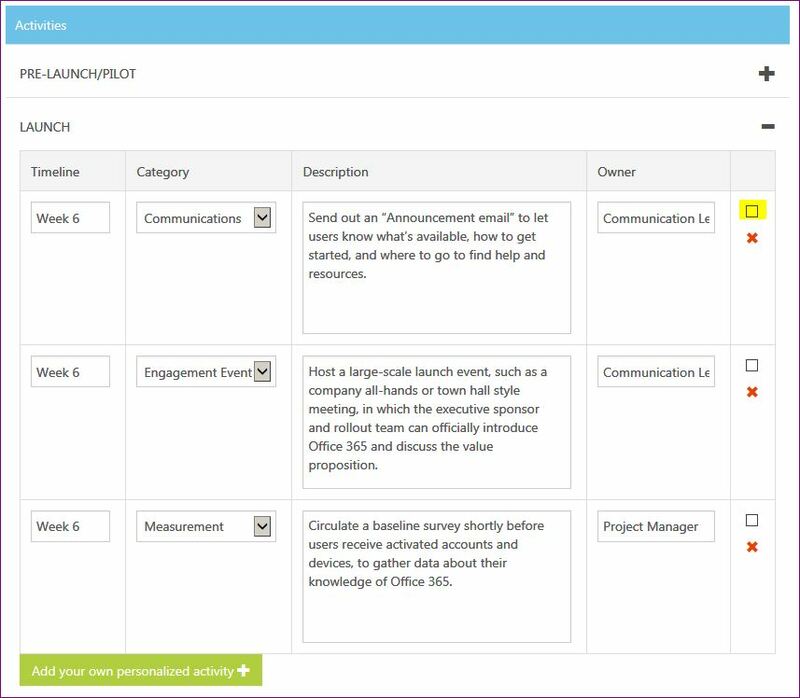 Selecting your Scenario filters the suggested Activities for your project. These contain a very complete overview of all possible actions during pre-launch, launch and post-launch, including a proposed timeline. There were a few that we had not thought of and gladly included in our plan. There were also a couple that were not relevant for us, so we removed those. Activities, grouped by Pre-Launch, Launch and Post-Launch. Replicate the names of the Stakeholders automatically into the Owner fields. 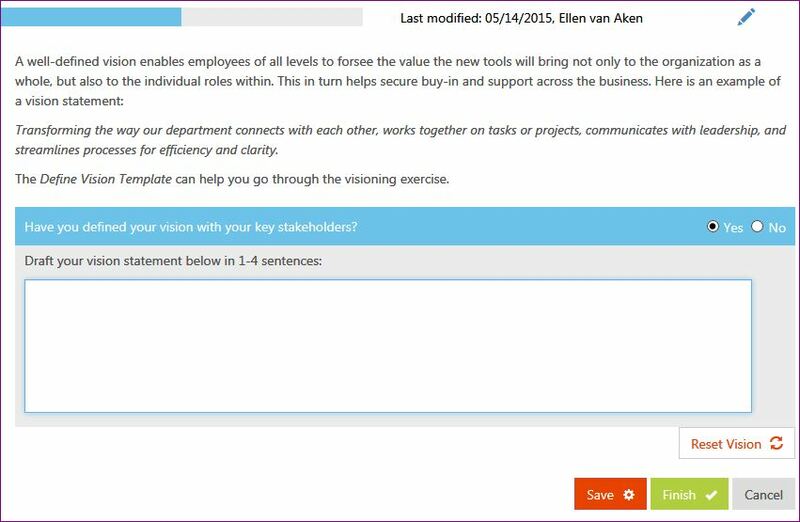 Replace “Office365” by “Yammer” in the Activities texts if you select the “Work like a network” scenario. 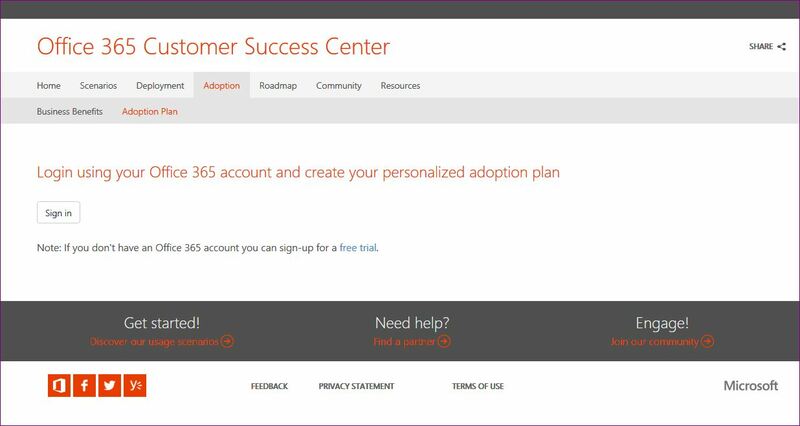 You can save and download a Snapshot (in Word) of your adoption plan, with all information you entered as well as a lot of explanation, tips etc. This turned out to be many pages (25 in our case for just 1 scenario! ), and it also does not sort as in the plan. I had to rework it (mainly removing all content that was not added/modified by ourselves) to make it into a concise actionable sharable plan. Add an option to create one Snapshot per scenario. 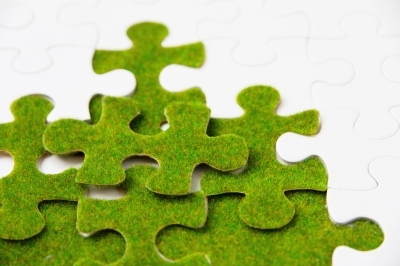 Success Metrics and Activities may be different for each scenario. 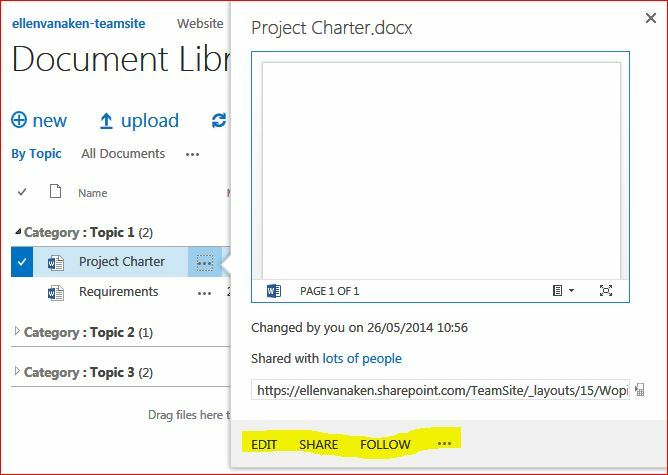 Make Snapshot available as PowerPoint and/or Sway so it can instantly be presented and/or shared. Check texts for consistency: e.g. the Stakeholders are called Project Members in the Snapshot. Accept the comments in the first pages of the Snapshot. The concept is excellent. This tool and the templates will help you structure your adoption plan for the maximum chance of success, without having to invent everything yourself. I have suggested some improvements mainly on the execution part. I expect Microsoft will be solving those soon. The current plan is already much better than when I used it a month or two ago. Have you used this tool as well and if yes, what were your findings? I was at SharePoint Connect in Amsterdam recently. It was great to meet some of my “fellow-nerds” again and I attended a number of great sessions by people whose blogs I have been following for some time. I noticed that the word “SharePoint” was used less frequently than the word “Office365”. As I sat there, I become more and more aware that my assumptions about Office365 were no longer valid. Office 365 = NOT online (Office + SharePoint). When I started using Office365 in 2011 (mainly to make screenshots for my blog) it was pretty much SharePoint online and the standard online Office tools. I think Lync was part of the game as well, and that made perfect sense to me. 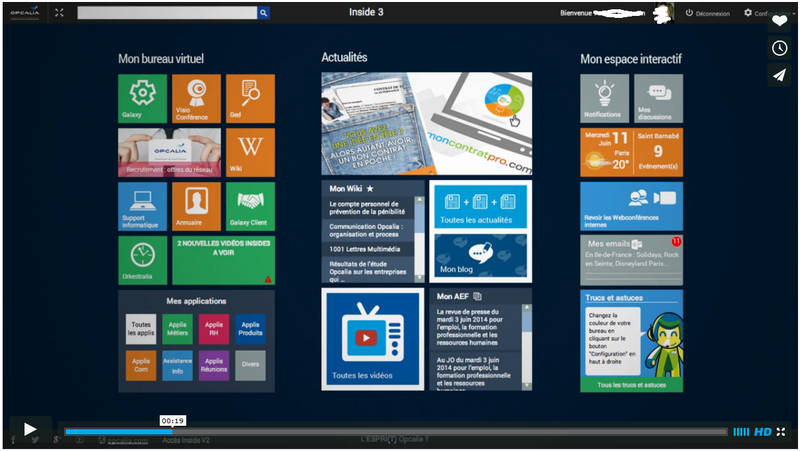 My Office365 apps -an integrated toolset. Please note I have a “Small Business” subscription so I do not have all functionality. I am so curious to see how this will evolve! There are also a few things that bother me. Not that “View all site content’ is now at the bottom of the menu instead of at the top and being called “Site Contents”. Or that the Recycle Bin button is now on the top right. Those are merely annoying because I have to retrain my end users, just after telling most of them that their content lives in “View all site content” top left. 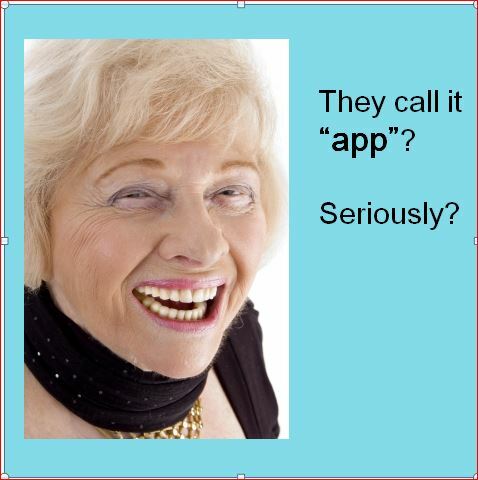 Not the fact that Lists and Libraries are now called Apps. It still makes me laugh every time I have to tell that to people! What bugs me is the fact that many things that cause issues will be harder to support now, because they are out of my control. The creation of Groups from Outlook for instance. I know already that Groups will be created easily and abandoned as quickly. Whether that is because of the current lack of functionality in document management, or because projects will be completed and forgotten, I do not know yet. But I expect tons of potentially damaging content (should have been deleted but is not), will be lingering out there beyond the company’s control because it is in someone’s personal space. I also expect issues with Sharing, because people are encouraged to share documents individually, by having that Share link in a very prominent place. It is even more prominent than editing properties or seeing version history. The first “Edit” link means editing the document in Word, Excel etc. What really bugs me is that Microsoft has decided to launch unfinished products, and that you only have a few weeks to postpone any launch. I am not sure if we can be ready on time with governance, maintenance, knowledge and training if something really new or controversial is introduced. What really really bugs me is that functionality may be changing very quickly, which may mean that investments you have made in training or solutions can be wasted if that functionality is retired. Or, worse, that my end users will not be able to keep up with the changes. They are experts in their own field and their digital workplace should support them, not challenge them every time with new functionality. Personally I am very excited to work with this changed and changing environment. But please be aware that Office365 is no longer “an office suite” and “an intranet” that both happen to be hosted in the cloud. The offer has transformed into something new and you will really have to rethink everything: ownership, administration, governance, end user support, design, etc.